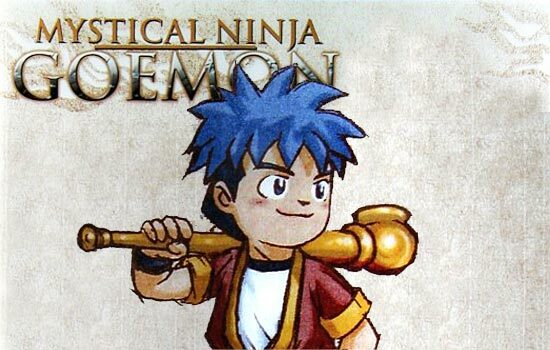 Goemon is a video game series revolving around the main character, Goemon, and his exploits. He primarily uses a variety of kiseru, a Japanese smoking pipe, as his weapon of choice. I was commissioned to make Goemon’s kiseru, a traditional smooking pipe, from the Goemon video game series. At the client’s request, it would be 48″ long. For the mouthpiece of the pipe, I was able to find a wooden finial the right size and checked it to my lathe for modification. Since the lathe was occupied, I attached a disk of MDF to a drum sander attachment spindle. 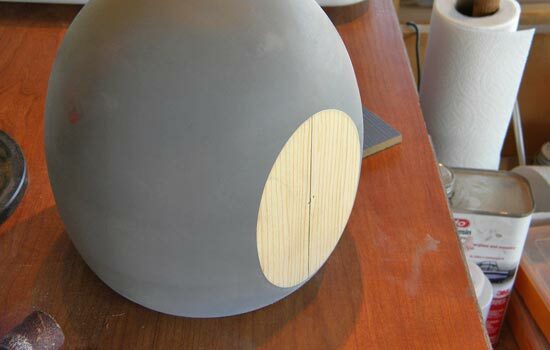 I was able to round the edges of the disk by spinning it with a hand drill and used sandpaper to shape the piece. 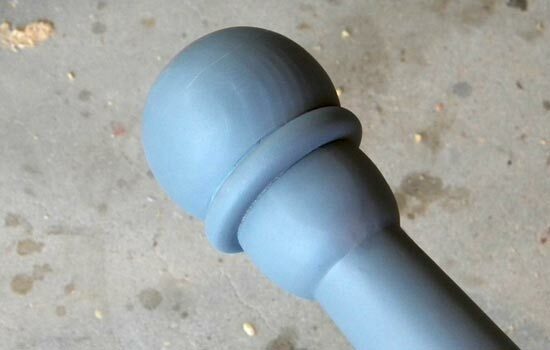 The finial’s ball was flattened slightly and I scribed a line for separating the ball portion. 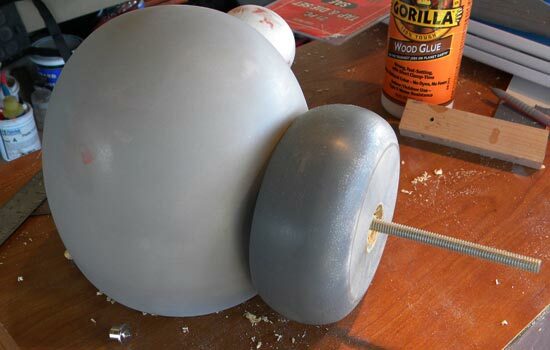 The finial ball and disk glued together over a threaded mounting rod. 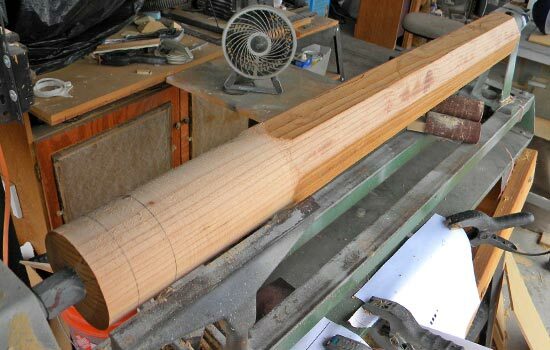 The head of the pipe was constructed by glueing together many sheets of pine and shaping on the lathe. I cut off the top of the bowl so I could re-attach it to the lathe to hollow it out. I flattened one side of the head to mount to the shaft. I made a collar out of MDF on the lathe. I used a threaded rod and wooden dowels to attach the collar to the shaft. 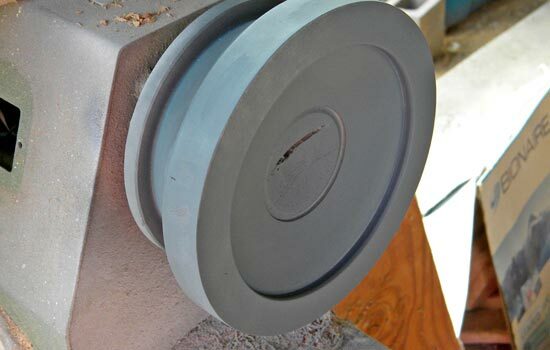 The collar attached to the head with the threaded rod exposed to attach to the shaft. I used a 4″ x 4″ to make the shaft. Here I’m starting to knock off all the corners. The mouthpiece attached to the shaft. I attached the rim of the bowl to the lathe and hollowed out a gentle bowl shape. 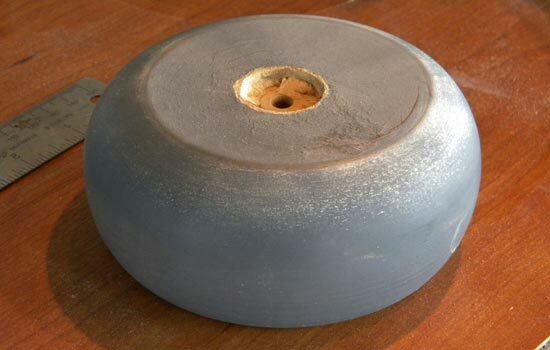 The bowl rim re-attached to the head. I forgot to make the hole in the mouthpiece so I had to drill it and hand smooth the edges. The final painted pipe. 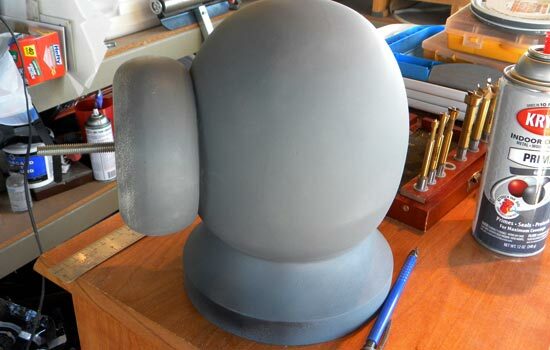 I used a brush to apply the paint so the paint has a brushed metal appearance.